Perimeter security buildings manned around the clock require a higher degree of creature comfort for your security personnel. For this reason, a guard boothincluding a built in restroom is often required. The security booth design can utilize restrooms for Security Officers alone, or, facilities for use by Visitors, either separately, or in the same spaaaaaace. 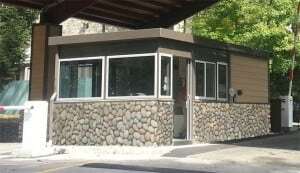 Restrooms these days are most often ADA compliant to meet the most current building codes. The standard Par-Kut factory assembled guard house fixtures are white china for the lavatory and water closet. Meanwhile, each portable steel Par-Kut building is designed to be installed over stubbed up pipes for water and sanitary. Holes are pre-cut in the floor of the portable security building to allow for a simple placement over pre-placed services. Restroom amenities normally include: toilet paper holder, paper towel dispenser, mirror, and a faucet. A point of use water heater and an exhaust fan are also provided in addition to the light and the GFI outlet in Par-Kut security buildings. 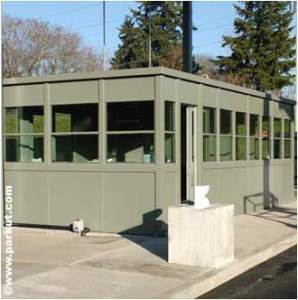 Once the Par-Kut security booth is on site, the mechanical contractor will usually surface mount (exposed) piping on the walls of the security building (see picture 11-058p). 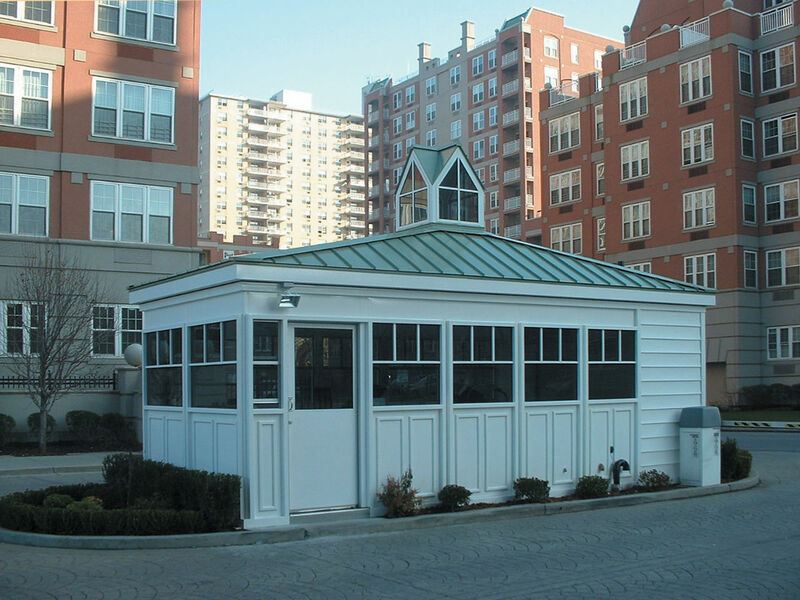 Alternately, you can specify that your guardhouse include a factory installed plumbing package designed for a single water supply connection and one sewer hook up. Chemical, composting, and even atomic toilets are also available for those locations where distances are cost prohibitive for traditional piping and plumbing.